If you read my previous post, you know that this year I realised the Advent calendar we've been using for 4 years got damaged in storage, forcing me to come up with a very short notice solution to make a new one. Fortunately, since I teach a number of kids art classes and workshops, I tend to hoard things like toilet paper rolls, kitchen tissue rolls and other assorted recyclables, so by a stroke a luck, I had enough cardboard tubes to work with. 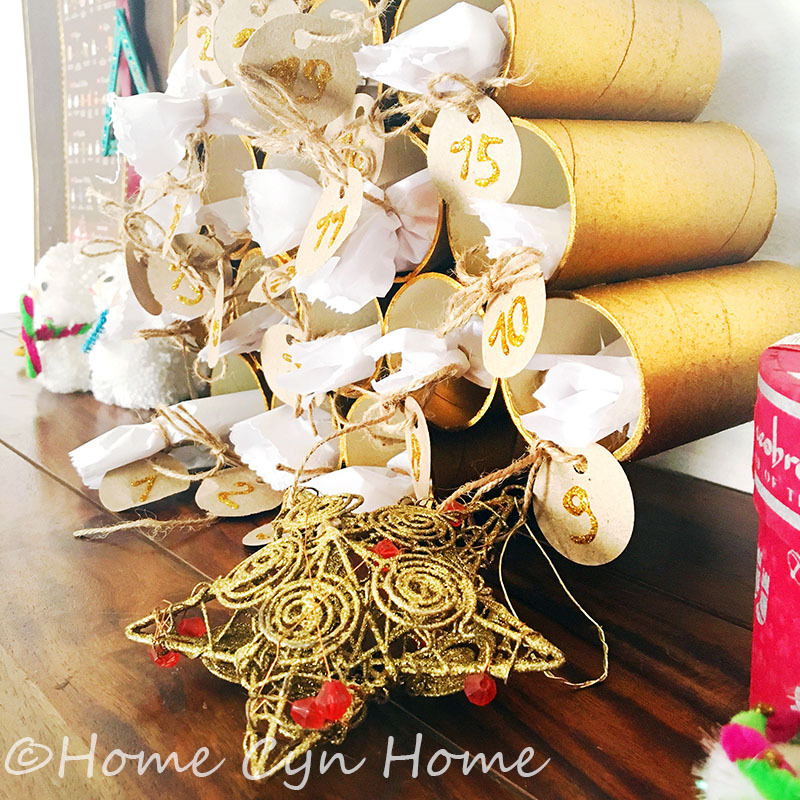 If this tube Christmas tree looks familiar, it's because I have done similar ones twice in the past, one of which makes it to my "Popular posts" as soon as the Advent season is around the corner. In the past two versions, I sealed both ends of the tubes, efficiently trapping a small gift inside. Ishita had to cut the paper open to free her surprise of the day. This time, I left it open on both side, with the idea that I could reuse it next year (if nothing happens to it in storage that is). 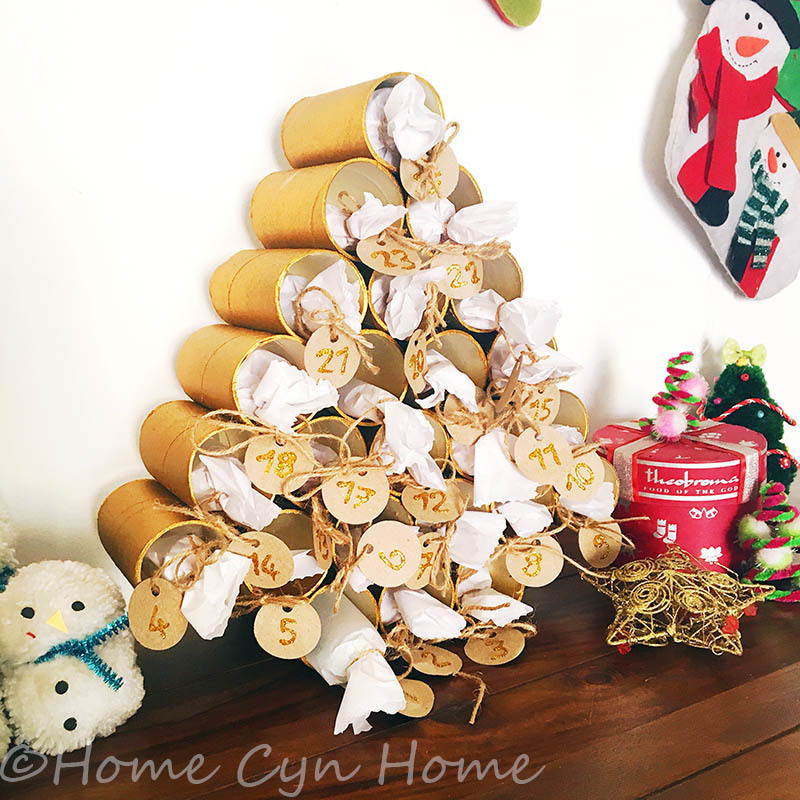 I glued 24 toilet paper rolls together in the shape of a Christmas tree, using quick drying "All Fix" glue (Amazon Affiliate link), but you could also use a hot glue gun, or even plain old regular white glue, though it will take longer to assemble everything because of the long drying time. Once my tree was glued together and dry, I took it to my utility balcony, covered my work surface and used the gold spray paint I had leftover from my tea and sugar tins project. I sprayed all the visible part in gold, but didn't focus much on the inside of the tubes, some have a light gold dust effect, some less. If you are really OCD and want your whole tree to be one solid color, you might need to use a paint brush and some Acrylic paint to paint the inside of each tube as spray paint is unlikely to give you an even result in those small cavities. I used plain white "kite paper", which is also known as silk paper in some places, to wrap each little presents. 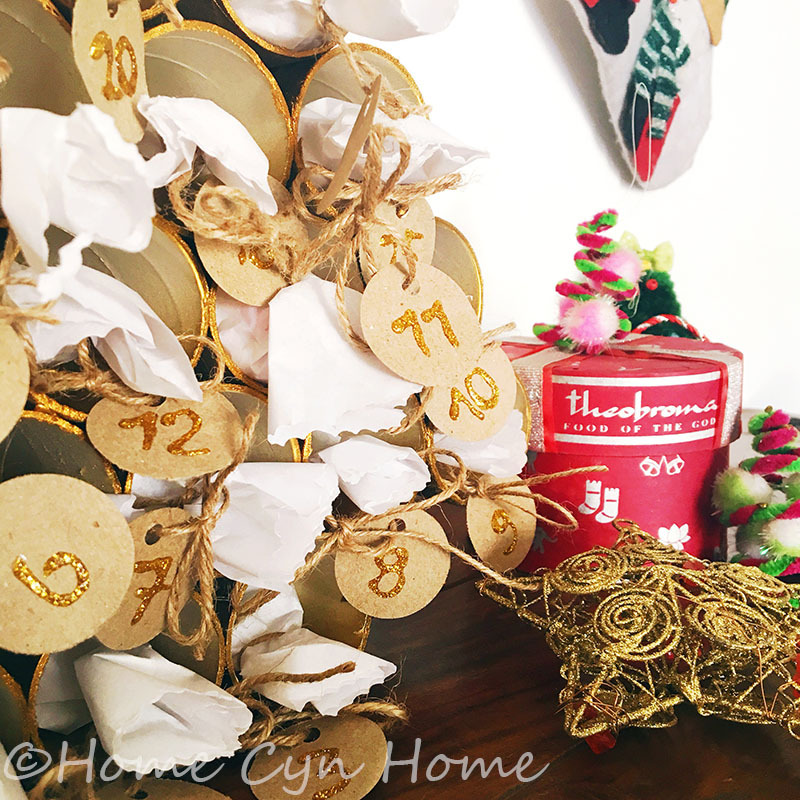 I tied one end of each gift with a natural jute twine and attached a little round tag that I cut out of a brown paper bag with my round paper puncher (another affiliate link). I wrote the numbers from 1 to 24 on each little brown tag before tying them to each gifts. Then I slid one gift in each tube and displayed the advent calendar in its usual spot on top of our chest of drawer in the living room. As to what goes inside the advent calendar, I wrote a blog post a few years ago. This year, I kept it simple, stuffing each rolls with small stationery items, marshmallows and chocolate coins. Ishita is a typical 9 years old that is in love with all things glitter and unicorns (what's with that trend???). Fortunately, my local stationery shop has no shortage of unicorn themed supplies like erasers, pencils, badges and trinkets, so my work was really all cut out for me, I got all I needed in 15 minutes in one shop, and for less than 1000 rupees, including the candies and kite paper. Fantastic. Who could have thought about such creative use of toilet paper rolls. Like Ishita, my son also loves glitter. He gets excited by the craft shows on tv. These glittery things end up in the most unlikely places like door knobs, tv, bottle caps and mobile covers. Not random but well thought out designs. His creativity is amazing. I think he has an artistic bend of mind. I go about the same with glitter :-) Or any material for that matter. A creative mind sees possibilities in the less obvious things, which is a sign of high intelligence. The 2019 Printable Calendar is here!